TODAY: Francona was discharged from hospital on Friday and is resting at home, Paul Hoynes of the Cleveland Plain Dealer reports (Twitter link). FRIDAY: Indians manager Terry Francona has undergone a catheter ablation procedure to correct an irregular heartbeat and will not manage the American League All-Star team next week, reports Ken Rosenthal of FOX Sports (all Twitter links). Cleveland bench coach Brad Mills will manage the AL All-Star team with assistance from Tampa Bay skipper Kevin Cash, Rosenthal adds. The Indians have announced, via press release, that Francona will be discharged from the hospital “within the next day or two,” adding that he’s expected to resume his managerial duties next Friday. Francona has been away from the Indians for the past three games and, in June, twice exited games after feeling light-headed and experiencing an elevated heart rate, as MLB.com’s Jordan Bastian writes. Mills has been managing the club in Francona’s recent absence and will continue to do so until he’s able to rejoin the team. Though it’ll be a shame not to see Francona in the dugout at this year’s Midsummer Classic, the health and well-being of one of baseball’s most well-respected figures is, obviously, a considerably higher priority. We at MLBTR join the baseball world in wishing Francona a full recovery and look forward to his return to the dugout. Indians skipper Terry Francona and Dodgers manager Dave Roberts have been named Manager of the Year in their respective leagues, the Baseball Writers’ Association of America announced tonight. It should be noted that voting is conducted prior to the playoffs, meaning their teams’ postseason performances aren’t factored into the decision. Francona, 57, guided the Indians their fourth straight winning season since coming on board as the team’s skipper prior to the 2013 season. Cleveland went 94-67 under Francona’s watch this year, running away with the American League Central division by a margin of eight games. Cleveland’s terrific season was all the more impressive due to the fact that the team’s best player from 2014-15, Michael Brantley, played in just 11 games due to difficulties recovering from offseason shoulder surgery. Francona also dealt with late injuries to Carlos Carrasco, Danny Salazar and Yan Gomes down the stretch as the team made its final push to the playoffs. 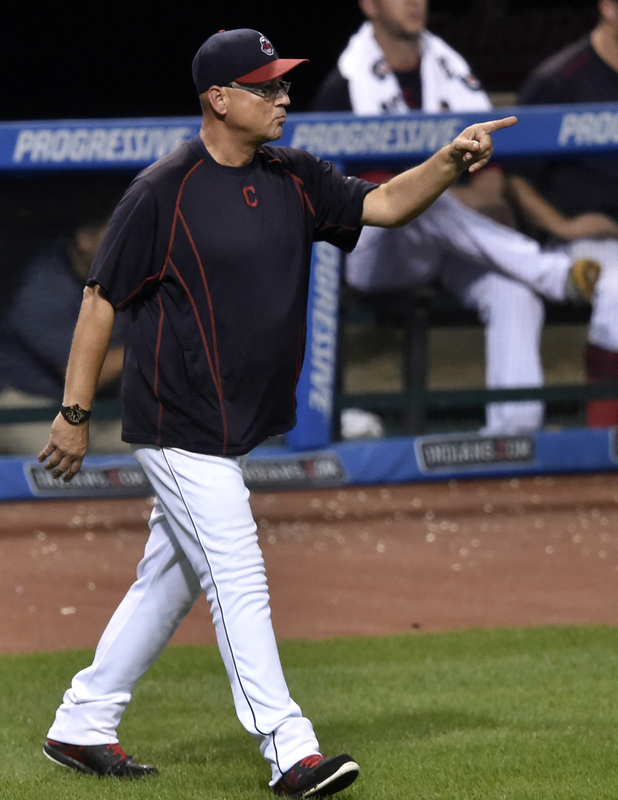 That performance led Francona to receive 22 of the 30 first-place votes from the BBWAA. Rangers manager Jeff Banister (four), Orioles manager Buck Showalter (two) and Red Sox manager John Farrell (two) also received first-place votes (link to full voting breakdown). This marks Francona’s second Manager of the Year Award in just four years with Cleveland, as he also took home the honor in 2013 — his first season with the team. His efforts have already been rewarded, as Cleveland announced shortly after the World Series that the 2019 and 2020 club options on Francona’s contract have already been exercised four years in advance. The 44-year-old Roberts takes home the honor in his first full season as a manager, having guided the Dodgers to a 91-71 record and a National League West Division title despite a multitude of injuries throughout the rotation — including a two-month absence from ace Clayton Kershaw. Fifteen different pitchers made starts for the Dodgers this year, with rookie Kenta Maeda starting a team-high 32 games and 20-year-old Julio Urias making the fourth-most starts at just 15. 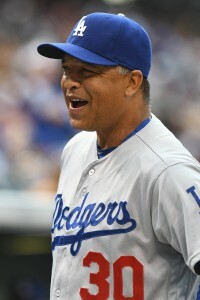 Prior to this season, Roberts had precisely one game of managing experience, stepping in for a single game with the 2015 Padres following the dismissal of Bud Black. Roberts received 16 first-place votes, while Cubs skipper Joe Maddon (eight), Nationals manager Dusty Baker (four) and Mets manager Terry Collins (two) each nabbed some first-place votes as well (full voting breakdown here). Roberts still has two years remaining on the three-year deal he inked prior to the 2016 season plus a club option for a fourth year in 2019. 10:01am: The Indians have now formally announced that both the 2019 and 2020 options on Francona’s contract have been exercised. The team also announced that Carlos Santana’s 2017 option has been exercised, as was previously reported yesterday and widely expected prior to that news. 9:15:am: The tweet in question has since been deleted, calling into question whether Francona’s options have or have not yet been picked up. The Indians had yet to make a formal announcement, though it remains entirely possible that such a move will ultimately come to fruition in light of the Indians’ excellent 2016 season. 9:00am: The Indians have exercised a pair of club options on manager Terry Francona that will extend his current contract through the 2020 season, reports Paul Hoynes of the Cleveland Plain Dealer (via Twitter). Francona’s previous contract with Cleveland had been slated to expire at the end of the 2018 campaign, but the team’s World Series run under his leadership prompted the club to make an even longer-term commitment in its skipper. The 57-year-old Francona has been serving as Cleveland’s manager since the 2013 season, guiding the team to a winning record in each of those four seasons including a pair of 90+ win seasons and two postseason berths (this year’s World Series drive and a Wild Card loss in 2013). As manager of the Indians, Francona has compiled an impressive 352-294 record, with this most recent season undoubtedly representing his most impressive campaign. The Indians not only made it to Game 7 of the World Series against the Cubs (where they took part in an instant classic) — they did so without their best player, Michael Brantley, for much of the season and did so in spite of an injury-ravaged rotation late in the year. Cleveland didn’t receive a start from either Carlos Carrasco or Danny Salazar in the postseason and also had to deal with a highly abbreviated start from Trevor Bauer in the ALCS due to a bizarre finger injury. Francona, though, leaned heavily on ace Corey Kluber and some expert usage of bullpen stars Andrew Miller and Cody Allen in order to maximize the team’s chances throughout the duration of the playoffs. While the end result of his managerial savvy certainly wasn’t what Francona or the Indians had hoped, it did nothing but reinforce the stellar reputation that Francona has amassed throughout his 16-year managerial career. Francona has previously served as the manager of the Phillies (1997-2000) and the Red Sox (2004-11), winning a pair of World Series in Boston. He has a lifetime record of 1381-1209 (.533 winning percentage) as a Major League manager. Given that the Dodgers were still in the postseason Saturday, left-hander Rich Hill was unwilling to discuss free agency or a potential return to Boston, but the late bloomer did give credit to the Red Sox for his shocking breakout. “Whether it was with (director of pitching analysis and development) Brian Bannister or (pitching coach) Carl Willis. Just the combination of those two guys,” he told Evan Drellich of the Boston Herald. “And also, just the overall opportunity that I did get there, I’ll never forget. Definitely translated over and started something for me that gave me a blueprint on moving forward.” Hill, of course, had a stint in the independent Atlantic League last summer. He then joined the Red Sox, turned in four excellent starts in September and inked a $6MM deal with Oakland last offseason. After continuing to post ace-like numbers with the Athletics and Dodgers this season, the 36-year-old journeyman will earn a substantial raise as the top starter available on the upcoming market. The Tigers are on a mission to shed payroll and get younger, but it shouldn’t come at the expense of right-hander Justin Verlander or second baseman Ian Kinsler, opines Anthony Fenech of the Detroit Free Press. While the Tigers don’t aim to rebuild, Fenech argues that they won’t be able to contend without those two. Dealing the soon-to-be 34-year-old Verlander would remove a Cy Young contender from Detroit’s rotation, though it would simultaneously free the team of some or all of an $84MM commitment through 2019. Like Verlander, Kinsler also had a stellar 2016 campaign, but the 34-year-old is due a far more palatable $21MM over the next two seasons. We’ve long heard chatter about a possible reunion between Yankees catcher Brian McCann and the Braves, and MLB.com’s Mark Bowman provides some hints about where things stand. New York has asked for righty Mike Foltynewicz or center fielder Ender Inciarte to part with the veteran receiver, which certainly sounds like a non-starter from here. An arrangement could yet make sense, Bowman writes, but Atlanta won’t include either of those two players. Indians righty Danny Salazar may not just be a part of the World Series roster; he may be able to start. Manager Terry Francona wouldn’t rule out that possibility to reporters including Paul Hoynes of the Plain Dealer. Francona has cast doubt previously on Salazar returning at all, noting that he had yet to throw at full capacity; this time, though, he says the prized righty was able to ramp up his arm speed and “threw the ball really well.” A three-inning sim game this weekend may decide Salazar’s postseason fate. The Padres are still finding cause to hope that righty Colin Rea can stave off Tommy John surgery, which he has sought to do through a combination of platelet-rich plasma treatment and rehab/rest. As AJ Cassavell of MLB.com tweets, the team is deciding just how to give him some postseason pitching work to help make a final decision. Rea could appear in the Arizona Fall League, take part in live BP, or even head out for a partial winter ball run. Regardless, Rea is set to throw competitively in about three weeks’ time. In other Central division news from earlier today, the Cardinals’ deal with Mike Leake became official, and CBS Sports’ Jon Heyman reported on the five-year, $80MM contract’s rather unusual annual salary breakdown. If team president Mark Shapiro departs to become president of the Blue Jays, Indians manager Terry Francona would not be likely to exercise an opt-out in his deal, Ryan Lewis of the Akron Beacon Journal writes. Francona’s opt-out allows him to leave the organization if Shapiro or GM Chris Antonetti were to leave first. He says he will not use that clause to try to land a job elsewhere. “When I came here, I think I was pretty honest about the fact that I came here because of Mark and Chris,” he says. “Since I’ve been here, my relationship with them has certainly grown, but also with the other people here, to the point where, I guess my point is I would never use that as leverage. That was not the spirit of the way it was written, nor would I use it like that.” Francona is currently in the midst of a deal that will carry him through 2016, at which point a new, two-year deal will kick in. That deal includes team options for 2019 and 2020. Here are more quick notes from around the league. David Price was not surprised that the Tigers traded him, MLB.com’s Jason Beck writes. “Just kind of understanding everything in the organization, not really,” said Price when asked if the deal caught him off-guard. “The Tigers are never sellers. They’re always buyers and they’re always making playoff runs and stuff like that. But at that time, I thought that was probably the best move.” Price describes his last few weeks with the Tigers as “just a weird time” in which it was unclear what direction the team would go at the trade deadline. Astros July trade acquisition Mike Fiers tossed a no hitter against the Dodgers last night. The 134 pitch performance was a microcosm of the Astros season, writes Evan Drellich of the Houston Chronicle. Fiers, 30, was the second piece in the Carlos Gomez trade. He was supposed to provide a little depth in the rotation – not outmatch a potent Dodgers lineup. The Astros are also doing more than they ever were supposed to – they currently have a 3.5 game lead in the AL West with a 67-56 record. Of course, Fiers’ no hitter isn’t completely shocking. He’s posted a solid 3.63 ERA with 9.13 K/9 and 3.25 BB/9. The same can be said of the Astros success. The club obviously entered the season with a few good starting pitchers, a powerful offense, and a revamped bullpen. The Indians may want to consider trading first baseman Carlos Santana this offseason, opines Terry Pluto of the Cleveland Plain Dealer.Santana, 29, used to offer more utility by playing catcher, third, and first. Now he’s locked into the cold corner due to concussion issues and shoddy defense. More importantly, his offensive performance is at a career worst. He’s been particularly bad from the right side which is peculiar given his strong career splits. Pluto lists several internal replacements. None are likely to approach Santana’s production. Also per Pluto, rumors that Mark Shapiro is under consideration to become the next Blue Jays CEO won’t affect the roles of GM Mark Antonetti or manager Terry Francona. While Shapiro advises on baseball decisions, Antonetti has full authority in that sphere. Francona originally joined the Indians in part due to Shapiro, but he also has a strong relationship with Antonetti. He can opt out of his contract if either executive is fired, but it’s not clear if that extends to one of them leaving by choice. Paul Hoynes of the Northeast Ohio Media Group echoes Pluto’s sentiments. He names a few internal candidates who could be promoted to club president, but also mentions CEO and owner Paul Dolan as a likely candidate. Veteran Tigers reliever Joe Nathan suffered a setback in a Triple-A rehab appearance today, as James Schmehl of MLive.com reports. Nathan came out after experiencing severe pain after the tenth pitch of his outing. Both Nathan and the club have stayed quiet this evening as to whether any more has been learned, but at a minimum it seems unlikely that he will join the team as quickly as had been expected. Cody Allen has struggled thus far, but the Indians are not contemplating a closer change, per Paul Hoynes of the Plain Dealer. “Cody is about as trustworthy and dependable as anyone we have,” said manager Terry Francona. The Cleveland pen has been poor by any standard thus far, and is not exactly teeming with alternatives. MLBTR’s Steve Adams noted that the team passed on an opportunity to upgrade there over the offseason, and it will be interesting to see whether that becomes an area to target if the Indians stay in contention over the summer.